Samsung certainly knows how to serve you breakfast!! 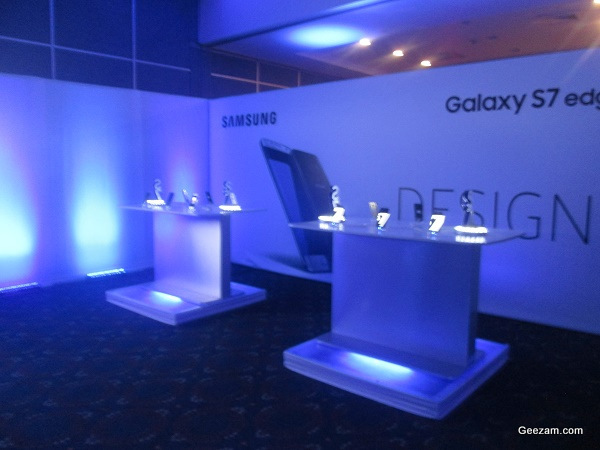 They did just that, for which I was grateful, when I got invited to their launch of the Samsung Galaxy S7 at the Jamaica Pegasus Hotel on Tuesday March 29th 2016 at 9:00 a.m. For those following Geezam Tech Blog, this is the same Samsung Galaxy S7 given away by Digicel’s Sponsorship and Development Manager Kamal Powell at the Bacchanal Fridays’ ‘Digicel Night’ on Friday March 18th 2016 as noted in Digicel’s Samsung Galaxy S7 Giveaway hints at Samsung Launch Event. 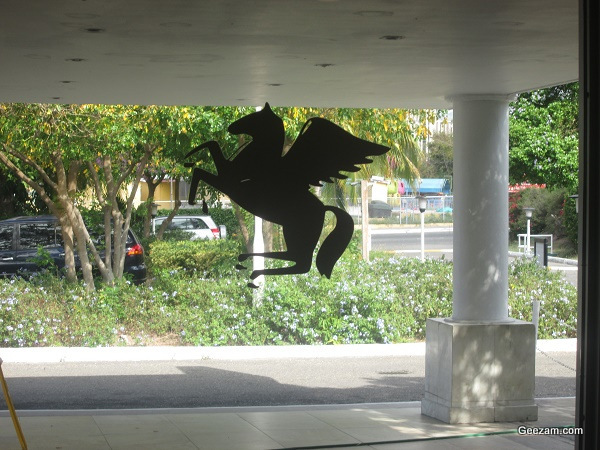 Still, I was quite excited as I sauntered through the automatic doors of the Pegasus Hotel at 8:25 a.m., to see the crowd-pleaser of MWC (Mobile World Congress) 2016 as described in Samsung Galaxy S7 and S7 Edge makes a big splash at MWC 2016. The venue instantly struck me as a scene straight out of the Movie TRON. While stepping in, my eyes caught the always lovely and super tall Samsung Girls, who were decked out in white pencil mini-skirts. They had “Samsung” in black colours in the upper right short sleeved shoulder that contrasted the pinned bare sleeved left shoulder which had gentle ripples of fabric. Inside, I was half expecting to see a Light cycle roll up beside me, as it was all themed in black, white, blue and sprinklings of silver and lots of columns of fuzzy blue lights shining upwards from lights on the ground. Slow jam Techno beat music set the mood, occasionally cycling to East Coast Rap music and mostly slow up tempo music that made me think, once again, about the club scene, TRON style. I checked in at the Samsung desk, where my name was automatically ticked off via the attendant with a Samsung Galaxy Tab. Cool black design for the desk though, with huge white lettering for the S7. At the very front was a stage that had a huge projector screen installed that was already looping a video of the Samsung Galaxy S7. I also saw signs that made me hopeful that the Samsung Gear 360 as described in How Samsung Gear 360 is a Creative Tool for YouTube VR Content was also here. Could the Samsung Gear 360 be here as well? In the middle of the black table was a 3D printed “S7” in white with black sides seated on a pedestal made up of LED Lights. This had a nice spiritual touch with a transparent square with blue Lapis Lazuli stones topped by a lily white rose. How exquisite! To the left I spied a Samsung selfie wall beside two plastic black tables circa the 1970’s. 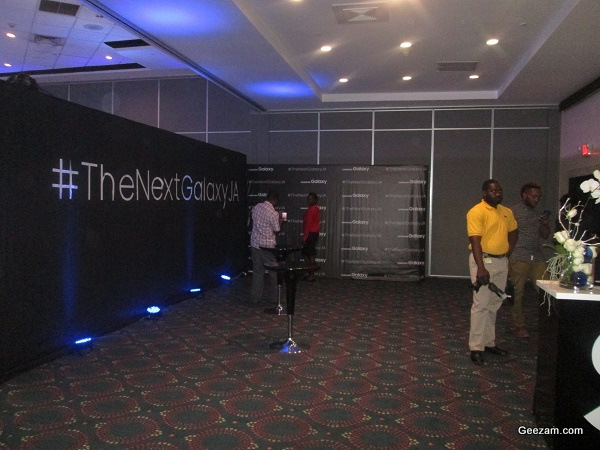 The selfie wall had the hashtag #TheNextGalaxyJa, which I was able to snap some poorly framed images. Dear reader, forgive me, as my camera and I were all shook up. Beside the self wall, which acted as a separator, was a White themed room, called the Samsung Experience Room which looked more like President Snow’s Throne Room, Hunger Games Style. It was fenced off with a black railing, typical of what you’d see at a bank with a flat HDTV at the back. At the periphery of the railing was a select elite of Samsung Representatives dressed in black sweaters with grey strips and collar, Men in Black style! This room was quite inspired with the words “Samsung Galaxy S7 Edge | Gear VR” on both walls with the wall at the back in bone white. On the left of the Samsung Experience Room was another gentle nod to the 60’s in the form of white eggs shaped chairs with silver metallic bases. There was a 1 1/2 foot white cube, glowing iridescent electric blue atop which were Samsung Galaxy VR headsets, all set outside of their boxes. On the right of the Samsung Experience Room were two silver tables resting on plastic pedestals that also glowed an eerie electric blue. A quick query from the Samsung Elite Guards revealed that the Samsung Galaxy S7 Edge was on the table on the left and the Samsung Galaxy S7 was on the right. One thing I must say, the speech, which began at 10:00 a.m. to introduce the Samsung Galaxy S7, the show’s headliner, was super brief. Head of Marketing at Samsung Electronics , Jennifer Rocha-Donley, introduced the Samsung Galaxy S7 Edge to the audience in a few quick lines after trying to awaken many of us. After all, it’s 10 a.m. in the morning; most Jamaicans normally are just getting awake at this time and were not as lively as Mrs. Rocha-Donley. Her segue paved the way for the man of the moment, Leonardo Silva, who made me realize Samsung was channelling the S6 Edge Plus as noted in How Next is Now for launch of Samsung Galaxy S6 Edge Plus in Jamaica. While out plates were empty (and some stomachs too) he filled our ears with his “We the People” themed speech, indicating that Samsung had decided to give their fans what they desired most. He started the S7 product video, which was narrated by his voice as he spoke largely of the marriage of Glass and metal to create their best smartphone yet. The Dual Pixel Technology the brighter lens, 1.7 aperture and faster shutter speed and more accurate autofocus, even in the dark is impressive. Images in the dark are brighter and sharper. What stood out for me was the fact that he mentioned the Samsung Galaxy S7 IP68 rating, which means a dunking of up to 1.5 meters of water for 30 minutes is no big deal. You still can’t go swimming with the smartphone, but you can worry a lot less if it decided to go for a swim during Bacchanal Jamaica 2016 or takes a tumble into mud while rafting down the Rio Cobre. Alas, I was not fast enough, as these super tall Uptowners crowded the desk, leaving me to wait until the crowd has thinned to take this first picture. Folks feast your eyes on the Samsung Galaxy S7 and S7 Edge! 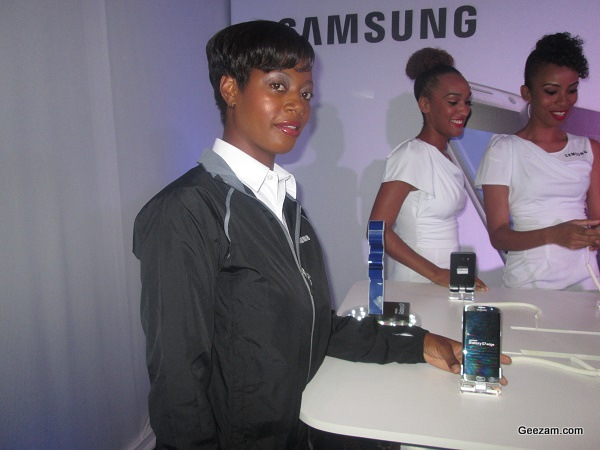 I soon got my turn to cozy up with one of the Samsung elite, Melicia Hinds, a Customer Care Executive, who was kind enough to explain the feature of the S7 as well as give me this great pose for the camera! The Panorama mode is back along with a Pro mode for Professional Photographers. A new feature, Hyperlapse, allowing you to take video over long timespans measured in hours and then sped it up in minute long playback. Adding back the nano SD card with 4GB RAM means that the S7 is light on its feet in terms or running games and apps and is capable of storing up to 128 GB of music, games and images. And yes the Edge Tab menu is back with a bag of tricks as described in How the Samsung Galaxy S6 Edge Plus is Jamaica’s smartphone Christmas Present, with more tweaks worth mentioning in an upcoming review article from fellow Geezam writer Kelroy. But my eyes beheld another marvel, the Samsung Gear VR, which I’d first written about in March 2015 as noted in Samsung Gear VR Innovator Edition expands your Galaxy. 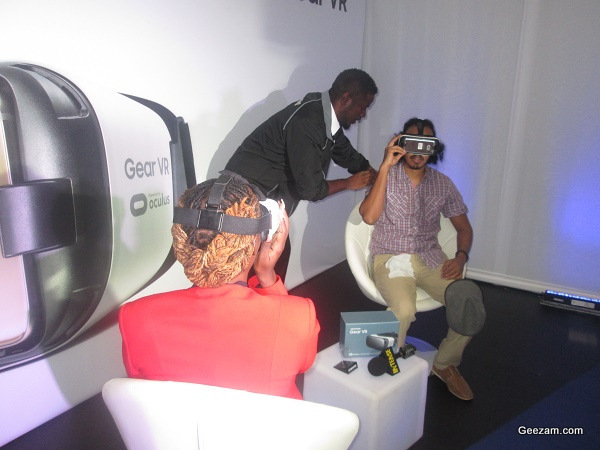 Scope out these pictures of people having a great time with the Samsung Gear VR! 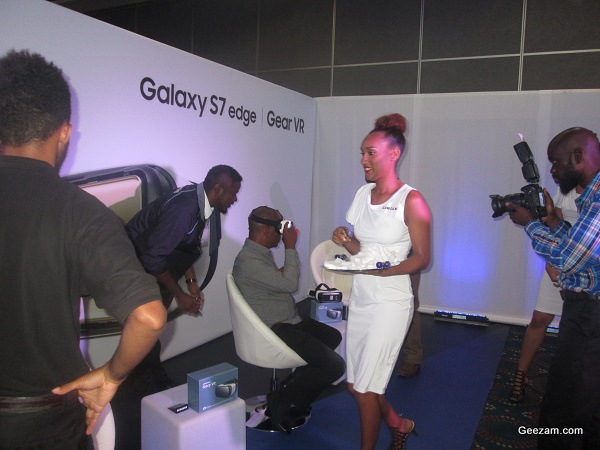 Each person was handed a sanitized towelette by the lovely Samsung Girls to wipe down the Gear VR before trying it on. I quickly found Mr. Andrew Lee, Jamaica Master Trainer for Samsung and quizzed him on the S7 and the Gear VR so that he could fill in the blanks. He told me that S7 had cases that featured a telephoto lens and that they’d soon be at the Samsung Galaxy Experience Store. This was the very same thing I’d recommended when I had been asked about suggestions for improvements to the photography capability to the S6 Edge Plus as noted in How to take High Quality Photographs with the Samsung Galaxy S6. The Gear VR, was an introductory device and not a fully fledged gaming device, despite 2016 being the year of VR a evidenced at CES (Computer Electronics Show) 2016 as pointed out in How CES 2016 is going VR thanks to HTC, Sony, Microsoft, Samsung and Oculus. However, it was a part of Samsung’s expanding product ecosystem, which included the Gear S2 which had landed on the IFA Trade Show in Berlin, Germany back in September 9th 2015 as noted in Samsung Galaxy Gear S2 has Tizen OS powered Samsung Pay Winning Potential. Samsung may make it into a Gaming console to compete with the likes of the Playstation VR as described in How US$399 Playstation VR coming in October started a VR Console War. Neither is there any content for the Samsung Gear VR as yet, only a handful of movies and games online. Still, it was exciting to see Sanjay from Intense, a popular program from Television Jamaica, get lost in a virtual world. But for now, the Gear VR is just an accessory to titillate fans of VR who have a S6 or a S7, as even the controls and the sound output, which is via headphones on the VR are rather basic and is not yet a full blown system. I’d have loved the Dual Pixel Technology, I’d have hoped it came with an absolute dark setting or even a night vision setting using Thermal Imaging using IR (InfraRed), allowing me to see in absolute darkness. This would make it great for Astronomy, as you could attach it to your Telescope and use it to take super sharp video and images of distant stars and planets. Finally, it would be great if they made a fully blown gaming system for the Gear VR, preferably using Tizen OS, the same OS used for their 2016 Smart TV that made its debut at CES 2016 as noted in How Samsung’s SmartThings Platform makes CES 2016 SUHD TV’s IoT Ready. The event, super early in the morning for us Jamaicans, has made me truly rethinking what a Phone can do for #TheNextGalaxyJa. Fellow write Kelroy Brown will be doing more in-depth review that will delve a lot deeper into the Samsung Galaxy S7. As for me, I’m gearing up for the Store Launch, which like the winged Pegasus, is sure to be coming very soon. With so many features being used by the Galaxy S7 and Galaxy S7 Edge, I really wish I could get one of each, or at least one. However, I guess I will have to just wait until I can afford the cost, which might just be a long wait. I need a miracle to own one or both of those gadgets. Love them!!! I’d really need to get one. This is just so amazing how technology keeps evolving and Samsung ain’t letting it leave them behind. 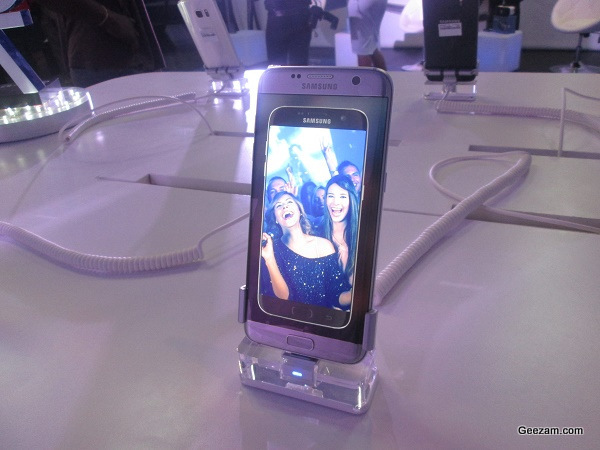 Pretty cool Samsung, I definitely need to get me one of these.